Over the past weeks I’ve been reading a number of non-fiction eBooks—don’t ask me, why, it just happened for some reason. The interesting thing is that I noticed a number of recurring eBook formatting problems that permeated virtually each one of these books, and I thought I’d touch upon the subject for a change. The problem in question revolves around terms that should be treated as a unit. Take a look at the screenshot and see if you can figure out what’s wrong with it. The problem her is, of course, the way the term “30 days” has been line wrapped—twice actually, and the term 1,667 words has been wrapped also. Plenty of bad formatting going on here! When you have something like this term, a professional typesetter will always make sure that the individual words in the term will not be word-wrapped… ever. There is nothing worse than having the number “30” on one line and the word “days” on the next, or worse yet, on the next page. It just doesn’t look professional and instantly gives off a whiff of amateur that you do not want in your book. In novels this is oftentimes not such an acute problem, because most authors would actually write “thirty days” instead, which can be wrapped perfectly fine, but by their very nature, non-fiction books often wrangle a lot of data and as such it is no surprise that I found the error striking in the past weeks in particular. The solution to the problem is fairly simple, really. If you are formatting your eBook in HTML, you simply replace the space between the words of the term with a non-breaking space character, like this: 30&nbsp;days. This way, you disallow the eBook software to break apart the entity. To achieve this one can use a very simple Regular Expression to isolate the cases. The concept is to search for one of multiple digits, followed by a space character, followed by a letter. will locate such instances. I do not recommend simply running a replacement on this search, however, because there would be too many false positives. Instead, simply go through them one by one and decide whether they need to be adjusted or not. I know, this is time-consuming, but that’s part of the reason why professional ebook formatting costs a bit of money. If you can actually make this practice to use Ctrl-space in all the right places part of your general writing habit, all the better, you will be properly prepared right off the bat, and you will make the life of your eBook formatter a whole lot easier. The thing about this kind of eBook formatting error is that it is not something that readers would report to you, but it is wrong nonetheless. It gives authors the impression that nothing is wrong with the eBooks, when, in fact, there are formatting errors in it. Many such issues can be evidenced in eBooks, pitfalls that most people are not aware of but that hinder the reading flow and somehow give off a bad impression. That’s why it make sense to hire professionals to handle your eBook formatting. Someone with credentials, someone who understands actual typesetting, in order to make sure these kinds of things don’t happen. Will you take a look at your books and see if you’ve been a victim of this particular pitfall? 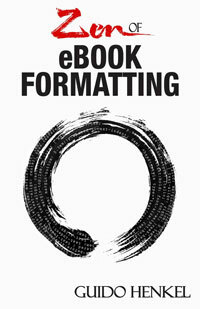 Zen of eBook Formatting is currently on sale for only $2.99 instead of its original $5.99 price!